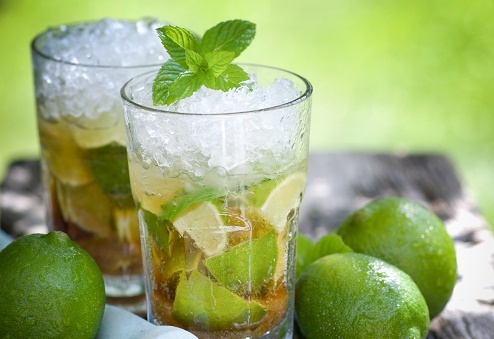 The national drink of Brazil, fresh limes make the Caipirinha tart and refreshing. If your specialty liquor store doesn’t carry cachaca, dark rum substitutes well. Start with a small key lime, quartered. Place half the lime in a tall rocks glass, and top with a teaspoon of granulated sugar. Muddle well and top with 2 shots of cachaca or dark rum. Fill glass with crushed ice and stir well. Drop remaining half of the lime into the glass before serving. This potent Brazilian concoction is also quite versatile. For a tangy twist, reduce rum to 1 shot, add a tablespoon of orange liquor, and replace lime with quartered kumquats. Which one of these low-cal cocktails are you going to try? Enjoy all the flavor of summer cocktails without the calories and guilt!